The name piranha comes from the teeth, which are very sharp and can cut flesh like butter and destroy its victim’s bones in a matter of seconds (pira means fish and ranha means tooth). Its body has an oval shape and the pectoral and pelvic fins are poorly developed. 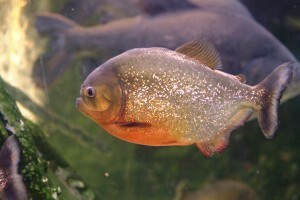 It is called red-bellied piranha because in the reproductive season its belly turns bright red. The red-bellied piranha is an aggressive fish and a very fast predator that swims in large shoals. It feeds on fish, seeds and fruit, but as a group can attack such large animals as an ox, generally wounded, which they detect thanks to their fine sense of smell. The reproduction season is after the rains, in the months of April and May. Spawning comes among the vegetation on the river bed and the partner defends the female very aggressively. It is found in slow-moving or still rivers, and warm (around 23ºC). The piranha is a fish that lives in the rivers of Central and South America. Its teeth are so sharp and cut so much that the guaycurúes and abipones aborigenes used their jaws as knives and scissors.